Make your garden a hedgehog-friendly place and you have the pleasure of watching them go about their daily, or should that be nightly, business. 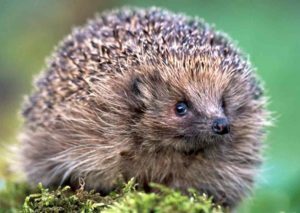 The Hogilow hedgehog habitat house was featured on the BBC program Autumn Watch. It is a nesting and breeding box for hedgehogs, but it may also be used as a sheltered feeding area if you prefer. This is a premium and has been designed with the guidance of the Hedgehog society. It has been manufactured using recycled plastic from agricultural waste. The roof has a swivel top which makes it easy for inspection and cleaning. Its sides contain breathing holes and the whole apparatus has raised feet for ground elevation, preventing rot. It is garden strimmer proof and has a maze-style entrance to prevent invasion by predators. roof with a very natural brushwood finish. It has a narrow entrance providing a deterrent from predators. The house can also be further camouflaged by other foliage and twigs. This house is at the lower end of the range but is great value for money. Many buyers are surprised by its sturdy construction and natural look. Also included is the fold out laminated hedgehog guide. This contains hedgehog facts, health, care and feeding. A percentage of the sales go to the British Hedgehog Preservation Society, so you are directly benefiting hedgehogs. This is a wonderful little hedgehog house. It has a unique aesthetic wooden design, and features a wooden doorway, roof and floor. It is made of FSC spruce which must be left untreated as paint chemicals can be harmful to hedgehogs. This model is at the more premium end of the market, but its inherent sturdiness should ensure that the hedgehogs get many years of use from it. This is the latest design from Riverside Woodcraft and it is a lot more roomy than the last model. It is of solid wood construction and has a slate-covered entrance and resin bonded floor. The roof is hinged and can be locked shut. The hedgehogs should really love this house as it is so roomy. A top-end product but well worth the money if the feedback is anything to go by and made of top quality materials. This is a robust and solidly built hedgehog house held together by woodscrews. It has an 18mm weatherproof and insulated roof made from solid recycled plastic and hinged with a lock for cleaning and inspection. It has solid wooden sides with a waterproof and rot-proof floor making it suitable for hibernating hedgehogs. This house, a premium product, has a very good reputation with most of its purchasers and it looks pretty good too.